Rooms reflect who we are and what we think. It shows the kind of personality we have and affects the mood we are in. A dull and messy room could result to a more cluttered mind while a sunny and neat room could end up you being productive all day. The best way then to lift your mood up is to see your room bright and motivational. 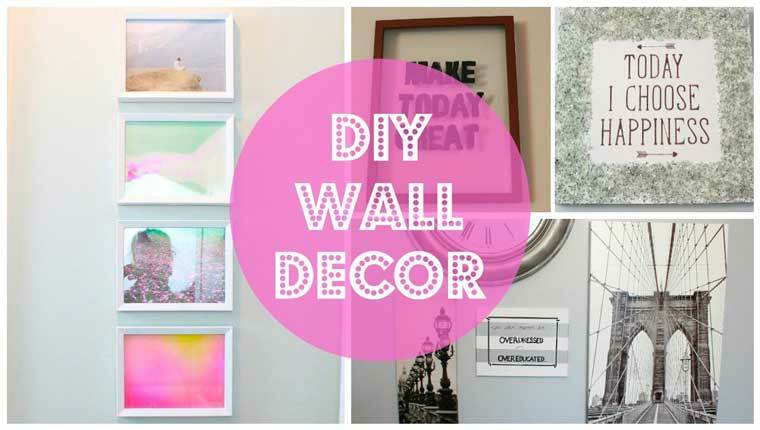 This do-it-yourself wall decor trick revamps your room to give out a brighter atmosphere with positive quotes hanging beautifully on your wall. There are four ways on which you can do this. The things you must prepare for all four DIYS are: picture frames (different sizes), acrylic paints, glue gun, paper bags with cute designs, decorative glass filler, mod podge, painters tape, sponge brushes and letters and finally sharpies. Yep, that’s all! All decors the video showed offer a minimalist effect but if you prefer some other materials to use, feel free to do so. The cute thing about this is that, you can do this by yourself and you’d create a comfier room for you. Warning: You’d probably end up making your friends wanting to have a sleepover in your room after seeing your homemade wall decors.